CSUN professors Joe Bautista (left, standing) and Dave Moon (right, standing) work with students on a project in the VISCOM office in the California State University, Northridge Art and Design Center. Photo by Lee Choo. 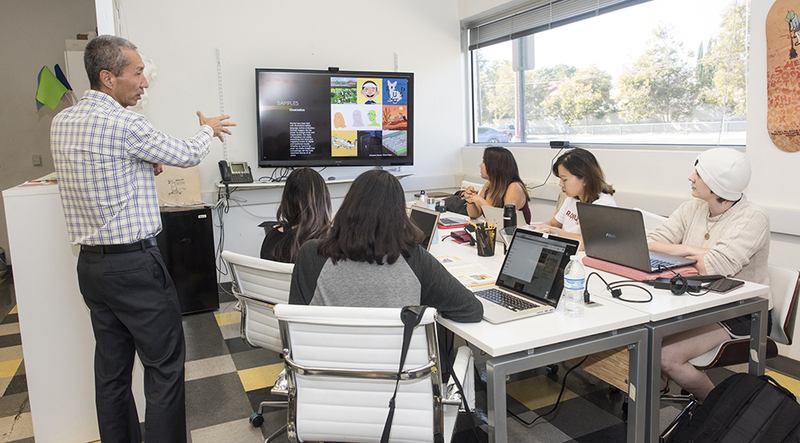 CSUN professor Joe Bautista (standing) works with students on a project in the VISCOM office in the California State University, Northridge Art and Design Center. Photo by Lee Choo. CSUN professor Dave Moon (standing) works with students on a project in the VISCOM office in the CSUN Art and Design Center. Photo by Lee Choo. 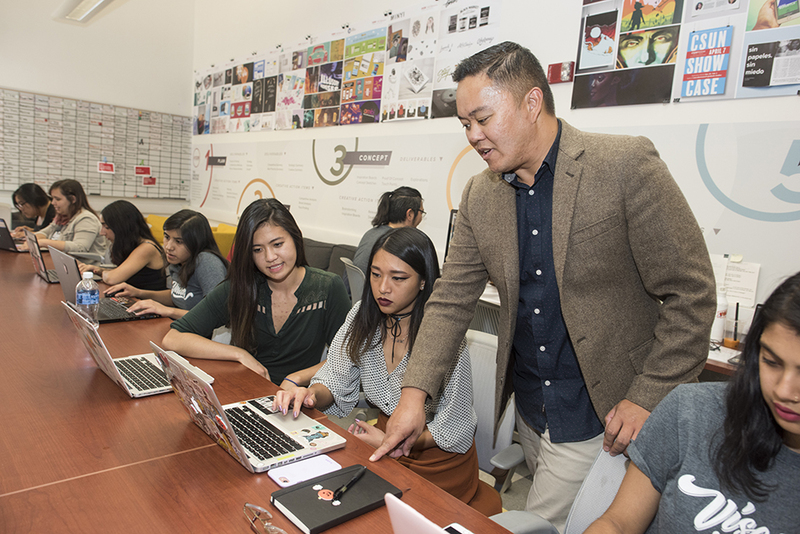 For 10 years, California State University, Northridge students in the Center for Visual Communication (VISCOM) have gotten a jump on life as graphic design professionals. Working for real-world clients on projects with real budgets, these students brainstorm and sketch ideas, field customer service calls, pitch concepts to clients, and refine their work until clients say it’s ready for launch. From kickoff through final invoice, students handle all aspects of a project, and they hear critiques from mentors and industry professionals along the way. In the program, founded by CSUN professor and alumnus Dave Moon ’89 (Graphic Design), students have designed a website and packaging for an award-winning dessert store, created motion graphics for an international luxury hotel chain, produced holiday videos for the LA Philharmonic, and developed branding and print design concepts for clients around the world. Now based in room 409 of the CSUN Art and Design Center Room, VISCOM started as an on-campus agency with five art and design students and two faculty advisers. A decade in, the program has impacted hundreds of students— including about 40 currently active members — across multiple disciplines, including students majoring or minoring in computer science, cinematography, journalism, English and more. The result: a network of current and future professionals who help one another succeed on the path to a professional career. “I need clients,” Moon replied. Soon, VISCOM was designing the bank’s website. Bautista, a part-time CSUN faculty member at the time, helped recruit the first five students and has worked with Moon ever since. The two CSUN alumni have continued to use their contacts to bring in work, leaning on the Northridge Chamber of Commerce and the Los Angeles Cleantech Incubator. With an established history, former VISCOM students working in the industry pass along leads. “The projects their agencies can’t bring in because they’re too small are the perfect size for us,” Bautista said. On a recent Thursday, four VISCOM alumni who work at or have interned at Yahoo! stopped by to meet current students. The alumni reviewed the students’ work, offered insights into the creative process, and provided tips on how to land a job and how to thrive. One of those alumni was Jazmin Orozco ’17 (Graphic Design), whose experience with VISCOM helped her land an internship and then a full-time job at Yahoo! Her responsibilities as a product designer include working on the company’s Denali open-source framework, which helps Yahoo!’s engineering teams develop internal platform products faster. The program has evolved with the industry. Students now often major in business marketing, with their interests — and VISCOM’s work — increasingly focused on brand strategy and big-picture storytelling. This focus helps students increase their value in the marketplace, where individuals who produce great designs alone have been commodified and can be hired inexpensively. To that end, Moon in 2017 launched a new student-run consulting venture, RADIUS, to work in concert with VISCOM. Based next door to VISCOM in room 410 of the Art and Design Center, RADIUS diagnoses a client’s competitive landscape and develops a strategy that VISCOM then executes. RADIUS is designed to help students become more than “stuff makers,” Moon said, and lets them develop integrated marketing campaigns. VISCOM helped Jamie Cristal Joaquin ’13 (Graphic Design) realize she could earn a living while pursuing her passions, she said. Joaquin came to CSUN as a pre-med psychology major, but kept taking art and design classes, until Bautista recruited her to his team. Soon, she’d switched her major and aced an internship at Yahoo! — to the point that the company hired her before she’d graduated. Now, she provides art direction and style guidelines for Facebook. Such success stories are VISCOM’s primary purpose, Moon said.